During her postdoc, she was involved in scientific teaching and mentoring programs on campus to learn how to be an effective teacher. She practiced teaching in the university’s Biocore curriculum, which she had gone through as an undergraduate. She also was involved in postdoc groups that brought industry leaders to campus to talk about their careers. After her postdoc, she moved to the University of Minnesota Duluth to teach medical students and do research with undergraduates. She also worked with several programs that strived to get more Native American students to pursue doctoral studies or medical degrees. The research she was involved in was related to Lyme disease. She has partnered with a company that is developing a portable real-time device to detect if a tick is harboring the bacteria that causes Lyme disease. She explains that in the future, it’s possible numerous people in this part of the country will have one of the devices. 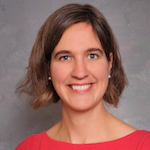 After being in Duluth for five years, she moved to a relatively new medical school branch in Wisconsin called the Medical College of Wisconsin – Central Wisconsin, where she is currently an associate professor on a clinician-educator track. The school’s mission is to train physicians that are going to practice primary care in northern Wisconsin. There she does some science teaching and keeps up her Lyme disease research with undergraduates but primarily helps coordinate the school’s community-based research programs, which every medical student is required to participate in.